What kourtney kardashian is wearing? ☆h&M blacalets☆ Aldo orange bag. A great summer look! 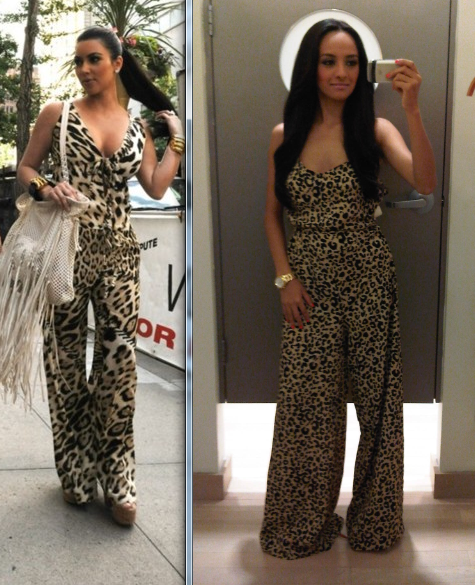 Leopard jumpsuit wearing better for you than Kim Kardashian. Very cute recreation! Where is the jumpsuit from? Looks amazing! Love your recreation! I adore the lipcolor! I love both of them! I really love you makeup too! Thanks for making so many post, I love your blog! I love the recreation of the outfit though i must say you could of picked a different type of shoe it doesnt really look great with the ones you picked. I'm not trying to be mean i love your blog and visit it all the time and love your outfits as I think you have great style and in my opinion (i know ur not trying to compete here) but better than Dulce Candy. Anyways i think the blush is a way over done you could use a lighter hand with it. You did it again! I so envy your talent in putting them together. I love Kourtneys look !! !did you buy the Jumpsuit ?? CONGRATS! I just saw kourtney kardashian featured you on her Blog! omg I am dying for your shoes!!! i have them in black but have wanted them in white/beige for so long! what exactly are they called on Amazon?? Thanks! so awesome you were on kim k's and now kourtneys!